UNITED NATIONS, February 2 -- With France taking over the Presidency of the UN Security Council for February, Ambassador Gerard Araud told the Press on Tuesday that Myanmar is not on the agenda, because no member had raised the issue. Video here, from Minute 34:12. This despite previous impassioned statements about Burma by both France and the UK -- the U.S. now seems to reply on Senator Jim Webb -- and other European members. A non-permanent Council member told Inner City Press that the idea is that Myanmar can be raised "as needed." The UN's policy, too, is on auto-pilot, with envoy Ibrahim Gambari having left the post temporarily in the hands of Secretary General Ban Ki-moon's titular chief of staff Vijay Nambiar. Ban's actual main advisor, deputy chief of staff Kim Won-soo, recently told South Korean outlet JoongAng that he and UN political chief Lynn Pascoe will travel to North Korea starting February 9. Since North Korea was not even in the footnotes of the program of work Araud presented on Tuesday, Inner City Press asked if Araud expected Pascoe to briefing the Council upon his return. "We have been informed of the mission of Mr. Pascoe and his team to Pyongyang," Araud answered, adding that a briefing after the visit was expected. Then why wasn't it in the program of work? France leads the group of experts about the UN Peacekeeping mission in former French colony Chad. Inner City Press asked Araud about Chadian President Idriss Deby's statement that the UN Mission mandate should not be renewed past its March 15 expiration. Video here, from Minute 8:01. Araud answered, "As you have said, I think it is right, the president of the Republic of Chad has signaled his will to see the force withdrawn after 15 March. But the Secretariat has sent a mission to N’Djamena, therefore there are high level contacts between the Secretariat and N’Djamena and we are waiting for the result of this mission." 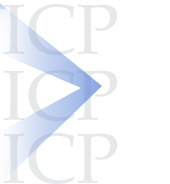 Sources tell Inner City Press that in the closed door Chad experts meeting, the U.S. told the UN Peacekeeping Department DPKO to not make any commitments while in Chad, but to return to New York for instructions. When leadership of the MINURCAT mission passed from the European Union to the UN, Deby used it as a chance to charge more money. And now? Araud on Feb. 2: this is not acceptable, where are your helmets? 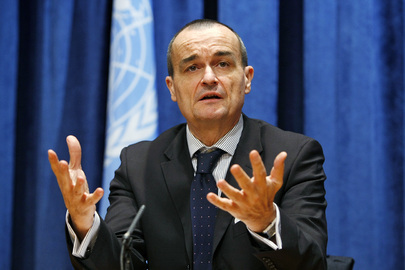 Surprisingly, when Inner City Press asked Araud about the finding of Guinea's national commission exonerating Dadis Camara for the killings on September 28, 2009, Araud responded with procedural notes about the Council supporting the political process, and praise for Burkina Faso's mediation. What about Dadis Camara's war crimes? What about a human rights component being added to the MINURSO mission in Western Sahara? It should be an interesting month. Watch this space. Footnote: Araud began the press conference in French, then stopped, to wait for non Francophone reporters to get their "helmets" or translation headsets. When this was delayed, Araud demanded, "C'est pas comme ca," it's not like that, not acceptable, saying, I don't speak English! Video here, from Minute 1:55. Araud said several times, I meet often to the press. 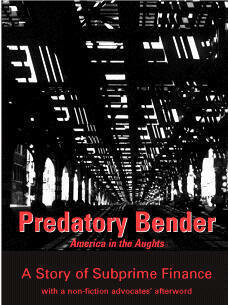 Inner City Press has inquired into this, and will be testing it this month. UNITED NATIONS, February 1 -- It's a new month and a new day at the UN. With France taking over the presidency of the Security Council from China, on the morning of February 1 other Council members met one by one with the presidency to discuss the month's agenda or program of work. It was not a formal or even listed Council meeting, and therefore the stakeout area was dark, with no other journalists present. One European Ambassador told Inner City Press, "You're all alone out here." U.S. Ambassador Susan Rice, on her way out, slowed and took a question from the Press. "Highly," Ambassador Rice said. 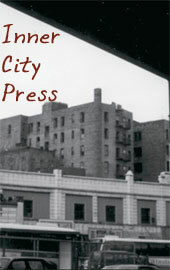 Inner City Press asked, "Haile?" -- it is Menkeios' first name. There was laughter in the half light. Ambassador Rice had been taking fire of light, including for not being present and accessible enough at the UN and Council in New York. Perhaps this is a new beginning. 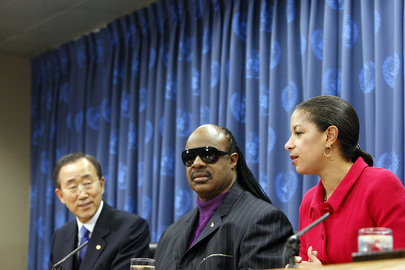 Susan Rice, Stevie Wonder and UN's Ban: faux tweeters afoot? A response to the criticism, signed by Ambassador Rice's spokesman Mark Kornblau, has appeared online. After Mr. Kornblau unleashed buckshot at flock of "canards" -- a l'orange? one wag wanted to know -- a snarky commenter retorted, "How much do you get paid to 'pump up' her IMAGE! obviously she isn't doing anything. if she was, then reporters would write what she was doing. instead, she has her assistant write a PR piece." But simultaneous with Ambassador Rice's exit from the Council, two tweets were posted in her new Twitter feed, noting two resolutions passed in January, and the handover to the French. Does she tweet and walk at the same time? Or, like Ban Ki-moon, is someone tweeting for her? Footnote: Other Ambassador greeted going in to consult with the French were those of Austria and Russia -- one wanted to ask about portions of Henry Paulson's memoir, more on this soon -- but not Croatia. The Mission of Bosnia is embroiled in controversy. The new Ambassador Ivan Barbalic is said to have requested the removal or reprimand of his deputy, Mirsada Colakovic. But Ms. Colakovic pulled rank, and made her putative boss withdraw the request. Meanwhile the Bosnian Mission pays more rent in New York than its Balkan counterparts. If you can't run your Mission, how will you be effective on the Council? We'll see.